How does thermal vision work? Thermal imaging senses the infrared heat generated by animals and any other warm object. It presents the difference in temperature, so warm blooded animals stand out from the cooler background. What else do I need to know about thermal imaging? Thermal imaging devices can't detect objects behind glass. Can I export thermal optic monoculars or night vision rifle scopes to foreign countries? You require U.S. State Department approval to export thermal optic monoculars and night vision rifle scopes, otherwise, it is a Federal Offense. Many U.S. technologies are regulated including night vision rifle scopes and thermal optic monoculars under the International Traffic in Arms Regulation (ITAR). It is also a Federal Offense to share, disseminate or otherwise publish operator's manuals or detail photography of the thermal optic monoculars and night vision rifle scopes sold on this website. For specific language regarding the exportation of thermal optics, monoculars and night vision rifle scopes, please click ITAR Regulation Language. 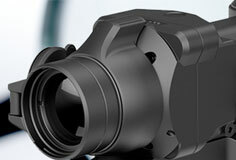 What are the strong and weak points of thermal imaging? With thermal imaging there is no place to hide. Animals are still partially visible behind some brush. On a warm night where the ambient temperature is about the same as the animals, thermal imaging will be less effective. Why should I buy a monocular? Are the thermal optic rifle scopes and monoculurs on this website available to US citizens of the general public or restricted to law enforcement and government officials? Yes, all thermal optic monoculars and rifle scopes are available to the public, and are popular among farmers and ranchers to provide additional hunting activities and ability to control hog and coyote populations. We're here to help you with any questions or concerns. Select the button below, fill out the form with your contact information, and the question/concern. We will respond within 24 hours during normal working days.